No matter your experience level, this is a must-have for every practice! Many dental teams struggle with ﬁling medical claims for dental procedures. This exceptional guide explains the different types of medical codes, how to complete the medical claim form, and how to submit proper claims to medical payers. Eliminate the apprehension of ﬁlling medical claims in your practice with the straightforward guidance in this indispensable guide! 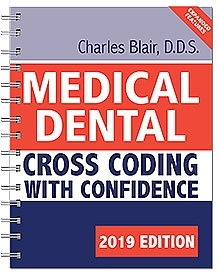 Order your copy of the Medical Dental Cross Coding with Confidence today to learn how to successfully submit medical claims for various dental procedures, including surgical extractions, dental related trauma, accidents, sleep apnea, TMJ, and much more! Dr. Charles Blair is one of dentistry’s leading authorities on practice profitability, fee analysis, insurance coding and administration, insurance coding strategies, and strategic planning. Dr. Blair has individually consulted with thousands of practices, helping them to identify and implement new strategies for improved productivity and profitability. He is a nationally acclaimed speaker for dental groups, study clubs, and other professional organizations, and is also a widely read and highly respected author and publisher. His extensive background and expertise makes him uniquely qualified to share his wealth of knowledge with the dental profession. Must be returned within 7 days of receipt of shipment. Must be unopened and still in the plastic wrap.